Thanks to Justin Scott, Melbourne, Australia for the foundation of this compendium. Leica Screw Mount Lenses "M39" "LMT"
The lenses marked with 6* are the lenses that can be updated with 6-bit code. Contact Leica Camera AG Customer Care for price and shipping. 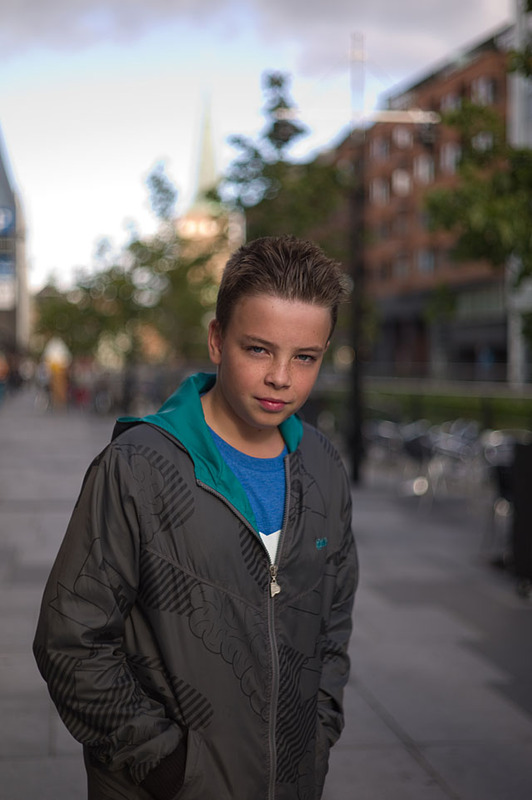 Version 4, also knowns as "King of Bokeh". German/Canada vers. Serial 2974251 to 3880946. 10 aperture blades. Noctilux-M ASPH silver (design by Peter Karbe). 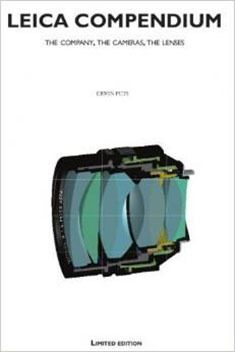 Lens design by Peter Karbe, lens and camera body re-design by Walter de'Silva. This is a redesign of the lens barrel texture, in anodized silver and with Hermes orange numbers. Body re-design in silver chrome finish with Veau Swift burnt tan calfskin leather. Only available in 100 pcs. limited set of Leica M9-P Hermes Limited Edition Jean-Louis Dumas with three lenses; 50mm Noctilux, 50mm Summilux and 28mm Summicron. Also with a limited edition Hermes Camera Bag. Price for the set at the release date May 10, 2012 - delivery July 2012- was € 40,000 / $ 50,000 for the set. 60mm filters, 560g, built-in hood. Same optics 1980-2007. From the introduction of the Leica M8 digital rangefinder all Leica M lenses were with a 6-BIT code so as to tell the camera which lens was mounted. This made it posible for the software to correct the image, and for the lens type to be read from the EXIF file. 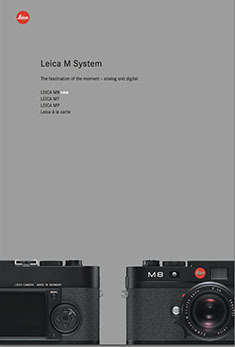 Most Leica M lenses can be sent to Leica Camera AG and get the 6-BIT code added. Alternatively one can buy a lens coder kit from a third part and ink code the lens (the Leica Camera AG coding is engraved). Since the introduction of the Leica M9 digital rangefinder another possibility also exist in that one can manually select which lens is on the camra and so get the adjustment and info the 6-BIT code else would give the camera. Silver finish made of brass. "Visoflex" lenses were made for Leicaflex and Leicaflex SL and Leicaflex SL2 ("Visoflex" lenses with R bayonet; mainly known as Telyt-R lenses) and for Leica rangefinder cameras (Visoflex lenses with screw-threat and using a Visoflex device between the camera and the lens (see definitions in the bottom of this site)). Can also be used for R3, R4, R6, R6.2, R7, R8, R9 (and Digilux 3 with an adapter). Some of these lenses are repeated in the R-lens section below for clarifying purposes. R-lenses for R3, R4, R6, R6.2, R7, R8, R9 (can also be used on Digilux 3 with an adapter). Can be used on Leicaflex, SL and SL2 unless the lens has a ROM contact. For Leica R lenses not already fitted with the digital ROM contacts, these can be added at Leica. The ROM contact contains detailed information about the lens for the lightmeter to use so that metering and exposure can be adjusted down to 1/10 f-stop. The ROM contact also tell the DMR digital back which lens is mounted so that it can be read in the EXIF files. Vario R zoom lenses for R-lenses for R3, R4, R6, R6.2, R7, R8, R9 (can also be used on Digilux 3 with an adapter). Can be used on Leicaflex, SL and SL2 unless the lens has a ROM contact . (for use with Leica R lenses of 50mm focal length and longer and for lens speeds from f2.0. Vignetting is to be expected with 400m and longer lenses. The 50mm f1.4 and 80mm f1.4 can also be used. Thus says the manual; however, in practical use this older 2X extender reduces quality of the picture, mainly light surfaces will 'glow' (or simply: This 2X extender will blur your shots to some degree. The newer APO-extenders below here does not). (for use with 50mm f1.4. 50mm f2.0, 60mm f2.8, 80mm f/1.4, 90mm f2.0 APO ASPH, 100mm f2.8 APO, 180mm f2.0 APO, 180mm f2.8 APO, 280mm f2.8 APO, 280mm f4.0 APO, 400mm f2.8 APO, 400mm f4.0 APO, 560mm f4.0 APO, 560mm f5.6 APO, 800mm f5.6 APO and 28-90mm f2.8-4.5, 35-70mm f4.0, 70-180mm f2.8 APO, 80-200mm f4.0 and 105-280mm f2.4). Read article for more lens versions. Also some of the M-lenses has been made available for Cine use. 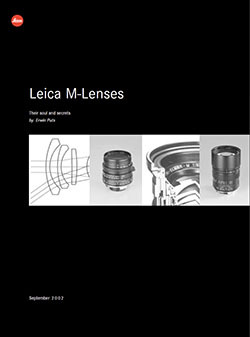 If you are looking for the Leica Lens Compendium (2001) or the Leica Compendium (2012 print edition and 2014 digital edition) by Erwin Puts, please wisit his website for more info, or try search eBay for his books (usually sold out from the publisher rather fast, so they become collectors items). 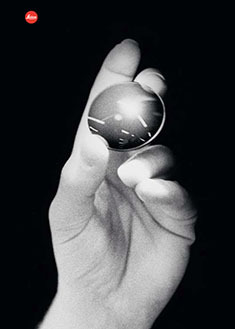 Erwin Puts: "Leica M Lenses Their Soul and Secrets"
The Lenses 1925 - 2000. This is the list of Leitz and Leica lens serial numbers and which year that lens was approximately produced. anastigmat an anastigmatic lens system (Leitz Anastigmat (Leitz I) from 1920 with a fixed 50mm f3.5 lens. Produced again as a retro camera in 2000-2002). anastigmatic (of a lens system) constructed so that the astigmatism of each element is canceled out. astigmatism a defect in the eye or in a lens caused by a deviation from spherical curvature, which results in distorted images, as light rays are prevented from meeting at a common focus. ORIGIN mid 19th cent. : from a-- [without] + Greek stigma 'point' + -ism. The f/ stop on the camera that regulates how much light passes through the lens. On a f/1.4 lens the lens is fully open" at f/1.4, at f/2.0 the aperture inside the lens make the hole through the lens smaller so only half the amount of light at f/1.4 passes through. For each f/-step you halve the light. The aperture is basically the focal length divided with the f/-stop = size of the hole (90mm divided with f/2.0 = the hole is 45 mm). stands for "apochromatically corrected" lenses. In most lenses, optical design concentrates the focus of blue light and green light into a single plane, but red light falls slightly into another plane of focus. Red subjects, therefore, would be ever so slightly out of focus compared to blue and green subjects in the same frame. In APO lenses, the design and expense has been put in to making red light focus on the same plane as blue and green. Under a microscope you would see that all light subject is now in focus, creating a sharper image overall. Many manufacturers offer APO designs, but in most of these only the very center of the lens is APO corrected. Leica prides itself on making most of the frame APO corrected. … stands for "aspheric design". Most lenses have a spherical design - that is, the radius of curvature is constant. These are easy to manufacture by grinding while "spinning" the glass. This design however restricts the number of optical corrections that can be made to the design to render the most realistic image possible. ASPH lenses, however, involve usually 1 element that does *not* have a constant radius of curvature. These elements can be made by 1) expensive manual grinding, 2) molded plastic, 3) Leica's patented "press" process, where the element is pressed into an aspherical ("non-spherical") shape. This design allows the manufacturer to introduce corrections into compact lens designs that weren't possible before. Practically, the lens performs "better" (up to interpretation) due to increased correction of the image, in a package not significantly bigger than the spherical version. There is another Aspherical lens manufacture technique: an uneven coating layer is applied to a spherical lens. The coating is thicker on the edges (or on the center, depending). Canon "Lens Work II" calls these "simulated" aspherical lenses. Simulated and Glass-Molded (GMo) asphericals show up in non-L Canon lenses, while the L lenses have actual ground aspheric elements. Describes the way light travels when it enters the R series Leica SLR bodies when viewing and composing. The light beam is split into two - one part goes through the semi-silvered mirror to the light meter at the base of the mirror box, the rest is reflected upwards through the pentaprism to the viewfinder. It is because of this "beam splitting" that you have to use Circular Polarizing filters on R cameras in order to obtain correct light meter readings. With regular linear pol. filters, phase cancellation effects occur when the light travels through the mirror, resulting in inaccurate and unpredictable readings. the visual quality of the out-of-focus areas of a photographic image, especially as rendered by a particular lens : It's a matter of taste and usually photographers discuss a 'nice' or 'pleasant' bokeh (the out-of-focus area is always unsharp why the quality discussed is if one likes the way it renders or not by a particular lens). Curently no origin known. Leica I Compur camera (1926-1941) and Leica Summicron (II) Compur 50mm f2.0 lens (1959). Central Shutter, as in the Leica S lenses for the Leica S2 where a shutter is located in the lens itself. How big a distance in an image that is acceptable sharp. The DOF is determined by the subject distance (the farther away, the larger area is sharp; the closer the focus is, the less of the lage is sharp), the lens aperture (the depth of field is narrow at f/1.4 and larger at f/5.6) and the focal length of the lens (tele lenses has very narrow depth of field whereas wide angle lenses has a wide depth of field) and film or sensor size (small-sensor cameras has a wide depth of field wheras medium format or large format cameras has a very narrow depth of field). The DOF is usually indicated on the lens by the focus barrel where one can see how large the DOF will be at different f/-stops for that lens. As an example, a Leica 21mm Super-Angulon-M f/3.4 lens is sharp all over the focus field from 2 meter to infinity when set at a distance of 3 meters at f/3.4. 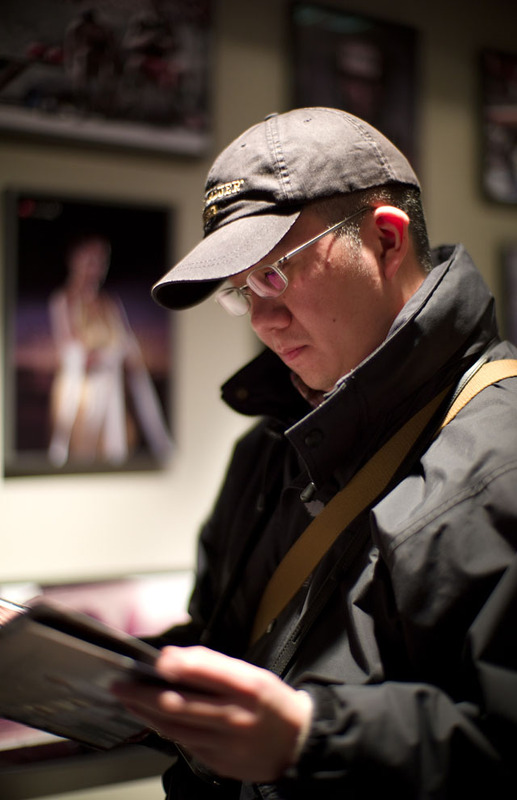 Leica 50mm Nictilux-M f/1.0 @ f/1.0 on a Leica M9. Ernst Leitz Canada, established 1952, was and still is the military/industrial branch of the old "Ernst Leitz Canada". In 1998, the ELCAN plant was sold to Raytheon (USA), who bought it from its previous owner, Hughes Aircraft Co.
Elcan-R is also the name of s series of lenses made in the 1960ies and early 1970ies, as the U.S. Navy High Resolution Small Format Camera System during the Viet Nam war. Refers to the maximum lens aperture - here f3.5 . 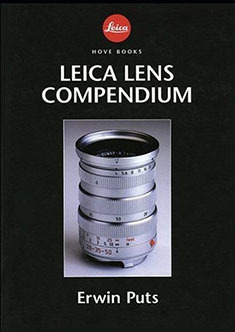 Historically derived from the original 1925 50mm f3.5 Elmax lens, which was an acronym of Ernst Leica and Professor Max Berak, designer of the original lenses. Later that year the 50mm f3.5 Elmar superceded the Elmax, which was discontinued due to its complexity and high cost of manufacture. Refers to the maximum lens aperture - here f2.8 . The name is obviously derived from the earlier (and slower) "Elmar" designation. Not every f2.8 lens is called an "Elmarit" though, the most obvious current exception being the 50mm f2.8 Elmar-M collapsible lens which for nostalgia and marketing reasons has kept the original 1930's Elmar name (the 50mm f3.5 collapsible Elmar, manufactured 1930-59, was one of Leica's most famous and popular lenses). Elmax = E. Leitz + Max Berak. Ernst Leitz was the founder of Ernst Leitz Optical Industry which later became Leica. Professor Dr. Max Berak was employed at Leica in 1912 and was the architect of the first Leica lens which Ernst Leitz asked him to design for the "Barnack's camera" (the 1913-prototype named after Oscar Barnack who invented it). The lens was a f/3.5 50mm and was known as the Leitz Anstigmat and later the Elmax. the ratio of the focal length (for example 50mm) of a camera lens to the diameter of the aperture being used for a particular shot. (e.g., f8, indicating that the focal length is eight times the diameter: 50mm/8 = 6,25 mm). One f-stop is a doubling or halving of the light going through the lens to the film, by adjusting the aperture ring. Adjusting the f-setting from f 1.4 to f.2.0 is halving the light that goes through the lens. Most Leica lenses has half f-stops to enable the photographer to adjust the light more precisely. The distance between the nodal point of a lens and the focal plane (the film or sensor in the camera). That is the construction definition based on simple lens systems where a 400mm lens would be 400mm long and a 50mm lens would be 50mm long. Today one call it effective focal length (EFL) as a 400mm lens is not nessesarily 400mm long due to optical constructions that can make it shorter. The 35-420mm zoom on the Leica V-Lux 1 is for example only ca. 135 mm long. For photographers it's more interesting that focal length indicates if it is a wideangle lens (ex. 35mm), normal lens (50mm) or tele lens (ex. 400mm). A 35mm lens is a ca. 54° viewing angle horizontal, a 400mm lens is ca. 5° viewing angle horizontal, etc. This is the practical, usable information about focal lengths a photographer can use. The Four Thirds System is a standard created by Olympus and Kodak for digital SLR camera design and development. A further development in this was Micro Four Thirds Systems. In sensors full frame usually refers to sensors the size of a full 24x36mm frame where one capture the same frame size as with 35mm film. The "full frame" technically deifinition thouhg is a sensor that camtures the full frame in one go (as the early sensors as in Leica S1 scanned the image/senor over a period of time). Refers to the maximum lens aperture - usually f2.5 . The name was apparently taken from the name of lens designer Professor Max Berek's dog. See Leica History article. Sub-manufacturer of lenses. Has made certain lenses for Leitz, Carl Zeiss, etc. a tube or ring attached to the front of a camera lens to prevent unwanted light from reaching the film. ORIGIN Old English hod; related to Dutch hoed, German Hut 'hat,' also to hat . … stands for "Messucher", which is German for "Viewfinder". The "3" in M3 was chosen because of the three bright line finders for the 50, 90 and 135 mm lenses. Later the numbers of the M cameras were more or less chosen to follow each other. "Meßsucher". It is always correctly written with the "ß". There are technically not three "s", rather the "ß" and one "s" because it is a word constructed by the combining of two precise words. M3 - MP - M2 - M1 - MD - MDA - M4 - M5 - CL - MD-2 - M4-2 - M4-P - M6 - M6 TTL - M7 - MP - M8 - M8.2 - M9 - M9-P - MM - ME (Type 220) - Leica M (Type 240) . Legendary Leica lens designer. Read more in Leica History. Stands (also) for Mechanical Perfection (Leica MP). Number, on this site Leica catalog numbers or order numbers. Some the numbers changed depending on the number of cams in the lens: The Elmarit-R f2.8/135mm started life as No. 11 111, however when fitted with 2 cams for the SL became No. 11 211, yet another No. for the 3 cams lens and a fourth number for 3 cam only at the end of its life. Number changes also applied to M lenses depending on whether they were screw-thread, bayonet or for M3 with “spectacles”. Thus the No. in this list is a guideline but not a comlete list of existing catalog numbers. Refers to the maximum lens aperture - here f1.0 . "Nocti" for nocturnal (occurring or happening at night; ORIGIN late 15th cent. : from late Latin nocturnalis, from Latin nocturnus ‘of the night,’ from nox, noct- ‘night. ), "lux" for light. The Leica Noctilux 50mm f1.0 was famous for enabling the photographer to take photos even there is onl candlelights to lit the scene and was replaced by the f/0.95 Noctilux-M ASPH 50mm in 2009. A Leitz mechanism attached to the (tele-) lens and held against one's shoulder when photographing, so as to stabilize the tele lens when using handheld without a tripod or monopod. The shoulder stock is attached to the lens same way as a tripod or monopod. SLR abbreviation for Single-Lens Reflex; the lens that forms the image on the film also provides the image in the viewfinder via a mirror. The 1933 lens 50mm f2.0 Summar: It started out as Summar (f2.0), then the Summitar (f2.0 in 1939), then the Summarex (f1.5 in 1948), then the Summaron (35mm f.2.8 in 1948, then later f2.0, f3.5 and f5.6 lenses), then the Summarit (f1.5 in 1949 and used again for the 40mm f2.4 on the Leica Minilux in 1995, then again for the 35mm, 50mm, 75mm and 90mm Summarit f2.5 in 2007) then the Summicron (f2.0 in 1953 for the collapsible 50mm) and finally the Summilux (50mm f1.4 in 1959). 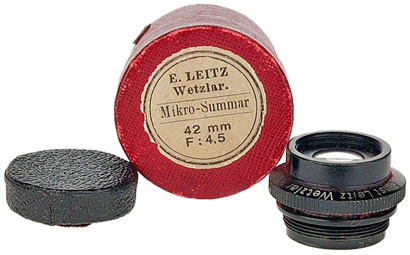 However, Leitz in Wetzlar made the Mikro-Summar 42mm f4,5 around 1910 for their Leitz microscopes (Leitz was orignally a microscope producer, see history site). Leitz also made a Mikro-Summar 35mm F:4,5. ORIGIN of Summar is unknown. Leitz Wetzlar Mikro-Summar 42mm f4.5 lens anno 1910 might be the first lens carrying the name Summar. Refers to the maximum lens aperture - here f1.5 . Refers to the maximum lens aperture - here f1.4 , "-lux" added for "light" (ie. the enhanced light gathering abilities). Lens nomenclature - short-hand for " telephoto " (tele- is a combining form, meaning to or at a distance and used in names of instruments for operating over long distances : telemeter. rapid-focus device from Leitz that was made from 1966 through 1973, in both R and Visoflex. It was originally designed for use with the 400mm f5.6 Telyt and 560mm f5.6 Telyt. Beginning in 1970 (with serial 2340953) the Televit could also be used with the 280mm f4.8 Telyt-V by using adapter 14138. Origin of name currently unknown. Leitz Thambar 90mm f.2.2. At most about 3000 were made, probably in eight batches, starting with 226xxx (actually built in 1934) and going through 283xxx, 311xxx, 375xxx, 416xxx, 472xxx, 511xxx, and 540xxx (about 1939/1940). Today they are staggeringly rare and extremely expensive: you would be lucky to get away with much less than $1500 for the lens without accessories (center spot, shade, cap), and you could easily pay twice that for a good, complete example with clean glass. Known to be a legendary soft-focus portrait lens that 'make a woman look 10 years younger.' A glass filter with a black spot in the middle, about 13mm (1/2”) in diameter cuts out the central (sharpest) part of the image and makes everything even softer. 1. The results are more or less unpredictable. Best practice is to shoot many times and pick the one you like best. 2. Shots against the light are generally more effective than with the light behind you. 3. The most pleasing results to my taste were with center filter at medium apertures. With luck portraits took on the "dreamy" look that the lens is famous for. 4. I never used the Thambar for anything except portraits. The lens has been rumored to be slightly radioactive due to the process of producing the glass. Here are some sample photos of Koichiro Itamura Photography. Here are some more sample images from Blue Penguin. Viewfinder a device on a camera showing the field of view of the lens. A device mounted between the Leica M camera and a lens, containing a mirror mechanism like in a SLR camera, thus allowing the M user to 'preview' a picture using a tele lens larger than 135mm which is the maximum covered by the frame lines in the Leica viewfinder. If you have further information, please send an e-mail to thorsten@overgaard.dk and I'll try to incorporate it.